First introduced in 1973, this chrome-plated steel juicer has a metal strainer that oscillates 3,450 times per minute. It is better at separating the juice from the pulp, ensuring that you get more juice out of each piece of citrus. This piece of equipment comes with three extracting bulbs, one for lemon/limes, one for oranges, and one for grapefruits. It weighs a hefty 31 pounds, so it will be sure to stay put on the counter while in use. 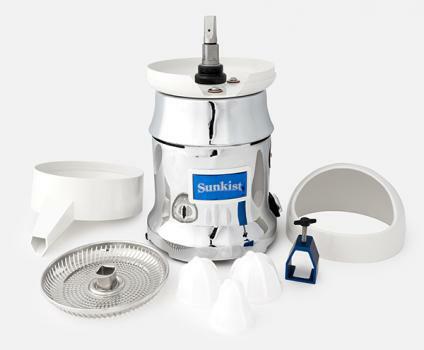 The Sunkist Commercial Juicer utilizes the same quiet, yet heavy-duty, motor design that we have been using for over 20 years. Like the saying goes, don’t fix what isn’t broken! Each juicer is made for longevity; they are manually built to ensure that the highest quality-control standards are met. This juicer’s ABS plastic dome, spout, and bowl support are all dishwasher safe, for quick and easy cleanup. It is also extremely safe to use, and is listed by Underwriters Laboratories, NSF International, CUL and CE, and is approved for use in Europe. It also includes a two-year warranty, in case of any unlikely breakdowns. The revolutionary design of our high-torque, metal, oscillating strainer ensures that you get the maximum amount of juice out of every piece of citrus fruit. It exceeds the demands required for restaurant use. This quiet, heavy-duty, durable strainer is able to oscillate at an astonishing 3,450 times per minute. 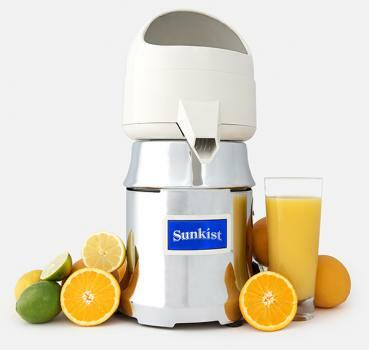 It sets the new standard for commercial-grade juicing equipment.